File S/T-16, obtained from Gary Cagné, Vancouver, BC. - Vessel name Spirit Of Tsitika, hailing port Victoria BC, trimaran, designed by Jay Kantola, LOA 35' 6" x Beam 24' x Draft 5' 6" (2' 6" board up) x 3 Tons - Sea anchor: 24-ft. Diameter military chest reserve on 300' x 9/16" nylon three strand tether and bridle arms of 50' each, with 5/8" stainless steel swivel - No trip-line - Deployed in a gale in deep water about 50 miles off the coast of Baja California with winds of 35-45 knots and seas of 12-15 ft. - Vessel's bow yawed 10° - Drift was estimated to be 9 n.m. during 17 hours at sea anchor. There is a certain grace and elegance associated with Jay Kantola's designs that one has to see to appreciate. His boats tend to remind one of certain benign and beautiful birds that roam across vast oceans on great wings. Not the feisty, competitive, acrobatic Frigate bird, whose flying skills and prize-winning antics one might associate with one of Richard Newick's masterpieces, but perhaps the magnificent, gentle, white-winged, black-browed Albatross of the Southern Ocean. On the way to Cabo San Lucas we discovered an incredible lagoon on the east side of Mag Bay, in which we spent several days lounging and hiking and bird watching. It's finally beginning to warm up a bit. Just left this morning with a nice offshore light westerly filling the new spinnaker we found at a thrift store in Santa Barbara for $25! As you can see we finally had a good opportunity to use the parachute sea anchor, and we're ever happy we did. We had the wind on the nose for 24 hours or more with torrential rain the whole time, and with a long offshore tack we ended up 65 miles NW of Cape Lazaro (near Bahia Santa Maria) when the wind got up to 35 kts at 1500 hrs. So we opted to set the chute, rather than continue beating to windward in those conditions. As soon as we were deployed (the deployment bag worked fantastic) the wind increased to 45 kts and gusting higher, with a steep short chop (8-10 ft.) on top of a large westerly swell of about 12-15 ft. The seas lengthened later on as the gale continued, enabling the bows to ride a bit higher. Initially they were picking up the tops of the [short, steep] waves and spraying the whole boat, pouring rain all the while and the barometer continuing to drop. Pretty easy ride once the waves began lengthening, and about 0300 next morning the wind eased off a bit and switched to SW 25-30. By first dawn we had a light westerly and very confused seas coming from various directions. We got underway after winching in the chute (very easy) and arrived safely, with no damage, later that night in Bahia Santa Maria. The next day we heard about Whistlin, a 37-ft. Searunner and several other boats that ended up having to power [jog] through the storm, suffering miscellaneous damage - mostly losing gear over the side and diesel problems. One monohull suffered a knockdown, and the group closer in to shore reported gusts to 60 kts! Whistlin has a surplus parachute on board but still needs to re-sew the shroud lines to it. Note: When we retrieved the parachute, we found that the float line had twisted itself many times, and even part of it was caught in two of the parachute shroud lines. So we learned that it is necessary to have a swivel for the float line as well. Claire and I are feeling more confident now that we've had our first parachute sea anchor experience and know how well it works. 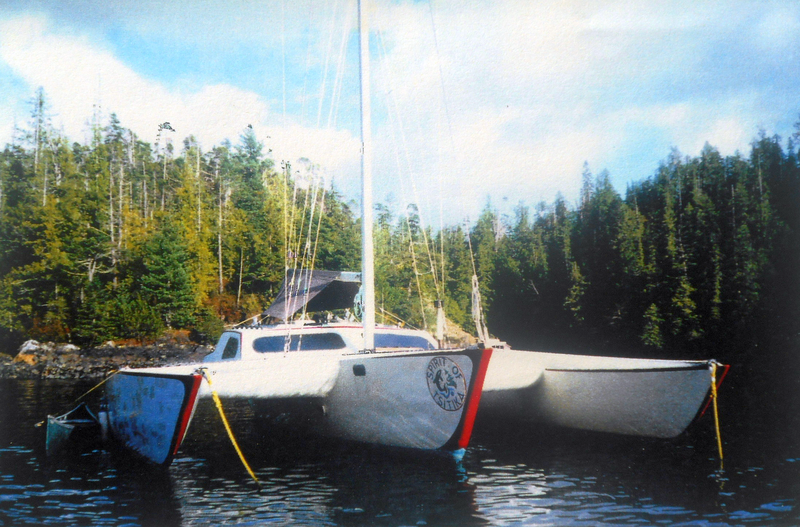 I first encountered Spirit of Tsitika in Crescent City about 1993. I later encountered her again and introduced myself. (I was enroute to Mexico in a Cross 38.) I had a number of conversations with Gary in La Paz. Later we rafted up with a small monohull in Espritu Santos and Gary’s Kantola for a great dinner. (Somewhere I have a photo of the three vessels.) It may have been Santa Barbara where he went up my mast and I adjusted the valves on his O/B. Great guy, would like to know where he is. Currently I am in the market for another cruising tri. I consider Kantolas to be a breed apart. They look great and are fast.